In a previous article, we have discussed about the comparisons and differences between Yeti Roadie and Yeti Tundra 35. However, some people are apparently still confused about what actually the differences are between the Roadie and the Tundra models. Because of that, in this article, we are going to outline the major differences between the Roadie and the Tundra models. So, if you are currently planning to buy a Yeti Roadie or Yeti Tundra model, make sure that you read the explanation below to get some insight! This is the most apparent difference between Roadie and Tundra. Yeti Roadie has been designed as the most compact and lightweight hard-box cooler in the line-up. Yeti Roadie is rated at 20, which means that the model can contain up to 20 lbs of ice inside. The model is recommended to be used with a 2:1 ice-to-content ratio, which means that the model can hold up to 14 cans of beverage along with the ice. Yeti Roadie is only available in one size. The size is only suitable for personal use or a small group of people and short trips. On the other hand, Yeti Tundra is actually quite similar to Yeti Roadie, except that it comes with more and larger capacities. The available choices are abundant, from 35 lbs up to 350 lbs. These capacities are suitable for a large group of people and long trips. Obviously, the Tundra models are bigger and heavier. Take a look: Yeti Roadie vs Igloo Sportsman. 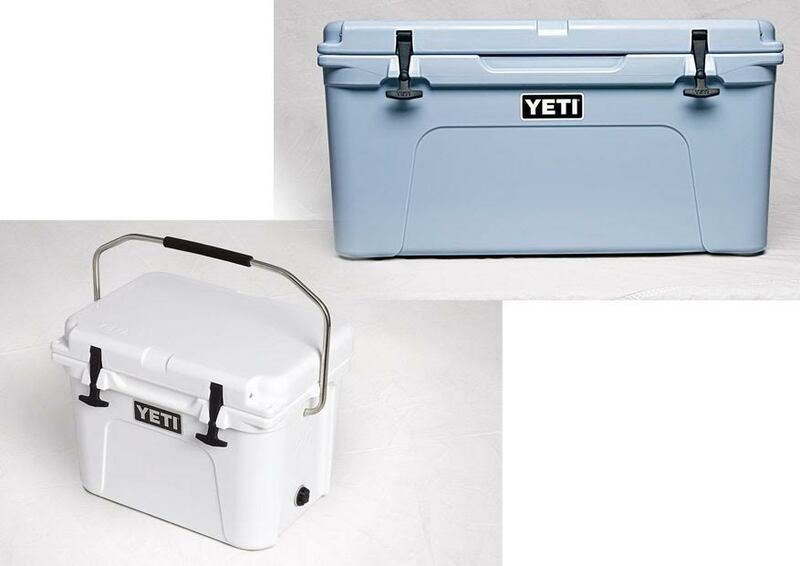 All Yeti cooler boxes have been crafted with rotomolded construction, ensuring total ruggedness and durability to face any extreme abuse. Both Roadie and Tundra are “grizzly proof” – neither can be destructed by a bear. Hence, they can be viable choices for camping and hunting in the wilderness. Both also come with secure and durable locks that prevent the lids from accidentally opening, plus the anti-slip feet that keep them in place. However, there is one nice distinction: Yeti Roadie has a stainless steel handle with a rubber grip, making portability much easier. No Tundra model has this feature. But we can be certain that all Tundra models have been designed with enhanced insulation. All Tundra models are generally able to preserve ice and cold temperatures for longer. So, Yeti Roadie is the compact and lightweight cooler with a handlebar. It is the perfect choice for short trips with just a few friends. However, for a large group of people and long trips, you should choose one of the Tundra models, which are of larger capacities and able to keep ice for longer.